Hello and welcome to the From the Heart Stamps March Blog Hop! We have a “CASE it” theme this month. Each team member will be showcasing a card CASE-D (copy and share everything) from another teammate. My card has been CASE-D from the wonderful Angela. You can see her super sweet card HERE. Here is my card using Balancing Hearts. You actually get 2 images in this set. On my card I have used the image without the stitch detail whereas Angela has used the stitch detail – both fab in their own right. To make this I have also used the following supplies: Paper by Pebbles – ‘Yours Truly’, Coredinations cardstock, Spellbinders Heart and Label Dies and Spectrum Noirs. The sentiment was made on the computer. As you hop along, please leave a comment on each blog. One random commenter will be selected on each blog to win an image of choice from the FTHS store – yay! Additionally there will be one lucky random winner selected from the comments left on the FTHS blog who will win a $15 voucher to the FTHS store – double yay! Thanks for hopping with us today. The hop will end on Monday March 7th at 6 am EST. Winners will be posted on the From the Heart Stamps Blog on Wednesday March 9th. Remember to leave all of our fantastic designers a comment on their blogs to have a better chance of winning! Karen, you’ve done a marvelous job case’ing Angela. Spot on. Always a pleasure to visit and once again I can’t thank you enough for you support and king words on my blog. Take care and happy hop. I’ve never seen this image before, Karen, and I think it is just so cute! Your coloring is so nice and I love your layout! Great take on Angela’s card! Lovely coloring and a fun layout with great dps! Great coloring and DP makes this such a tweet card! Awesome CASing Karen! Fantastic coloring and papers! Love that image and your colour scheme! Great card! Love your card, you did a great job casing it. Glad you shared with us today. Spot on Karen!! Love your coloring and paper colors too! Gorgeous card! This is a totally sweet card and case. Love the bold colors. Super cute…such pretty colors and coloring! I like this better than the one I made…wink! Great CASE job. Love the way the black layer makes the colors pop. Thanks for the fun blog hop! Love your CASE of Angela’s card! You definately created the same feel as Angela did…just to sweet and too cute! This is very sweet, Karen. Fun design and dp combo! This is gorgeous!!! I love the colors and the clean lines! I know from the card you sent me how perfectly you put things together, and I can just imagine this card is the same!! great paper choice and you colored it perfectly to match. Great design too. Adorable!! I love this take on Angela’s card! Your papers and elements are different but still perfect! Great take on Angela´s card, Karen. LOVE the bright colors on yours – just great. You’ve CASEd Angela perfectly. The colours and papers are spot on. What a lovely card. Great CASE!! And wonderful colours! Fabulous case of Angela. I love the colors and layout. Gorgeous coloring, too. So glad you CASE’d this card…as I’ve somehow overlooked this cute stamp set! This is just darling. The little birdie perched on the hearts makes me smile, and your colors are lovely. Super sweet card, Karen! Love the little birdie and fun mix of colors & patterns! Absolutely beautiful CASE, Karen! Love your papers and colors!! Such a happy card! I love this image and it’s one I don’t have so may need to! Great colouring. I love the colour of the bird! What a wonderful collection of patterns you combined in this beautiful card! WOW! 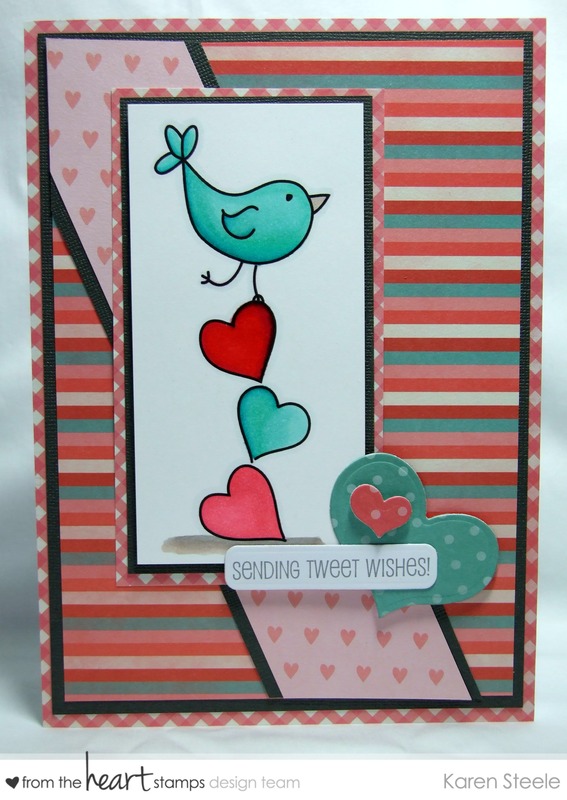 Cute card with the bird and the hearts! Love the colors and all the stripes, too! Wonderful job CASEing Angela, gorgeous card! Love your take on Angela’s card. I really need to use this image, which I’ve had for a while now. just adorable case of Angela’s card Karen. I love your colors. Love how you kept the card very similar, but switched it up with subtlety! Great card, Karen! Caseing cards is so much fun, and it’s so inspiring to see how we can pick inspiration from each other. You did a great job with this one, so cute and perfect for many occasions, and the sentiment doesn’t limit your options either.